KANSAS CITY, Mo. 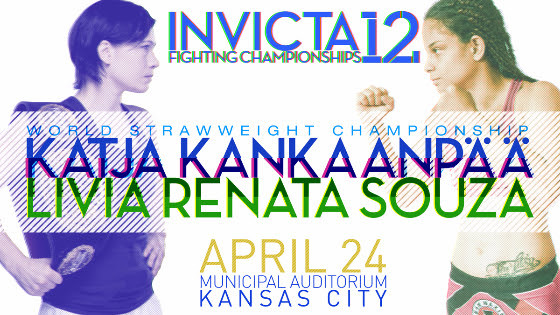 – Invicta Fighting Championships today announced the new date and location for its next event, Invicta FC 12: Kankaanpaa vs. Souza, which will stream live and exclusively on UFCFIGHTPASS.com from Municipal Auditorium in Kansas City, Mo. on Friday, April 24.Invicta returns to Kansas City for the first time since Invicta FC 8 after hosting its last three events in Houston, Davenport, and Los Angeles. Kansas City, currently the promotion’s base of operations, served as the site of each of the first eight Invicta cards.